Sometimes, users have a new large hard disk (HDD) or a more efficient Solid state drive (SSD) and plan to clone their old HDD to new one for replacement. 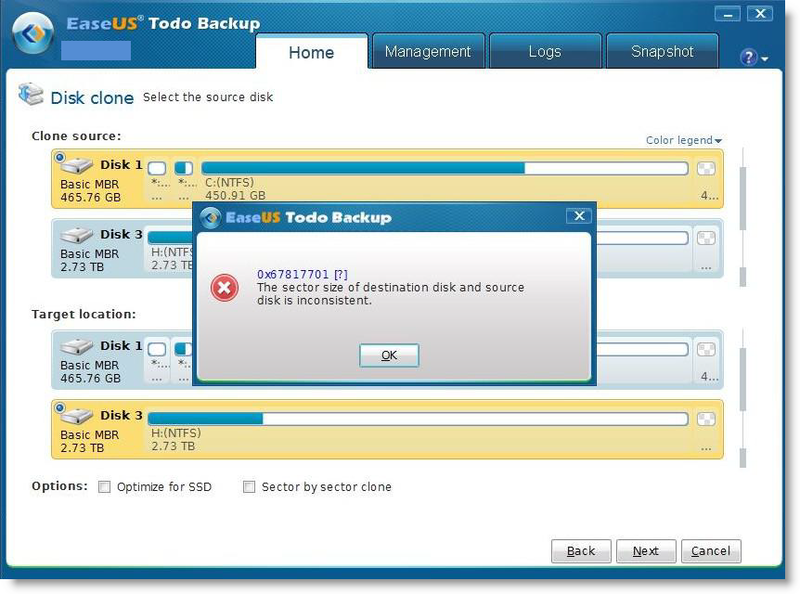 However, an error ‘0x67817701, the sector size of destination disk and source disk is inconsistent’ may appear after click Next in EaseUS Todo Backup clone process, just like the picture below. A basic term Sector requires to be known first before reading further explanation of the error. HDDs have physical sector (the minimum storage unit on a hard drive) size determined by its geometry and logical sector size. Info about logical sector size is always stored in disk controller and is reported to operating system (OS), determining how OS sees this drive: as 512 bytes per sector or as 4K per sector drive. Traditional drives come with 512 bytes per sector both on physical and logical level. However, according to the increase of hard drive capacity and user requirement to handle larger files in more efficient way, new hard drives include 4096 bytes per sector for both physical and logical geometry was introduced by the end of 2007. And another special Advanced Format Drives (AFD) have 4,096 (4K) bytes per physical sector but emulate 512 bytes per logical sector. For these hard drives, It is not possible to copy one to another if logical sector size of target drive differs from logical sector size of source drive. That is because data integrity usually cannot be ensured between different logical sector drives. Enter ‘system info’ in Windows search box, and expand Components > Storage in system info window to locate Disks option, logical sector size will be listed in the right hand detailed box. If the disk is connected by USB interface and the two disks have same sector size, and you still get this error when attempting a Restore or Clone operation. 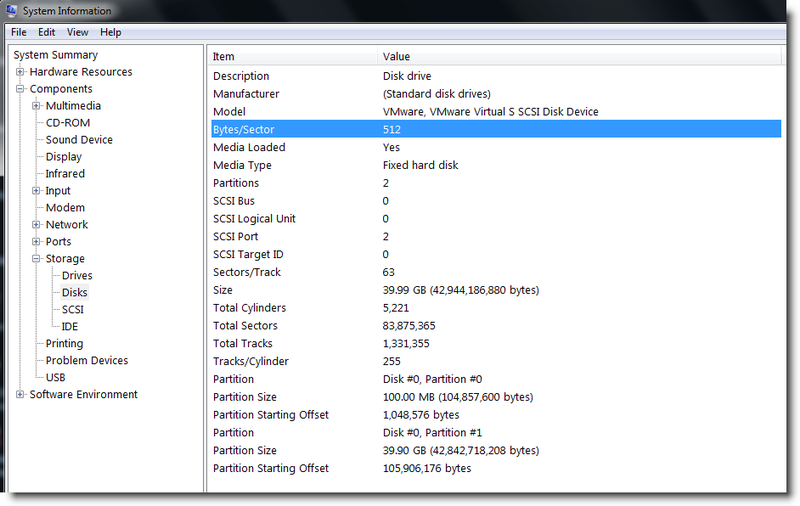 This is because the USB disk enclosure is changing the reported sector size of the disk. This case can be avoided by connecting two disks with SATA/IDE at the cloning or restoring process. EaseUS Todo Backup Free/Home 10.0 and later version is able to clone between hard drives with different logical sector size. It is suggested that you can upgrade your old version to the newest version to use this function. The entirprise edition will also support it from V10.5.